Vanentin’s day is right around the corner. Do you have a special person in mind that you want to surprise on the day? 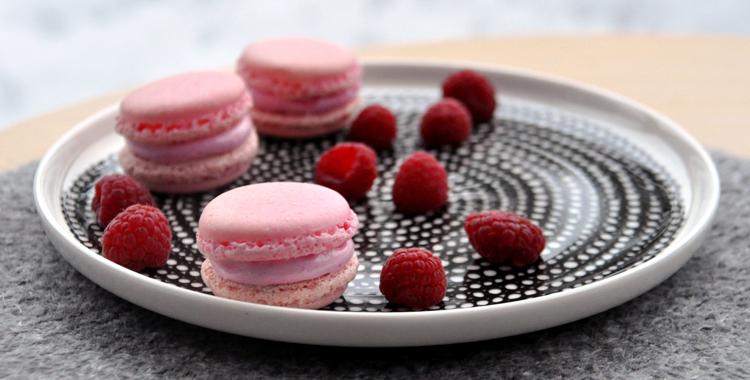 If so, these macarons are my suggestion: romantic and sweet, but still with a fresh and fruity raspberry flavor. Follow the base recipe to make the macarons. Add red or pink concentrated food coloring to the mixture, while beating the egg whites. Bake and cool the macarons. Put gelatin powder in a bowl with 1-2 tablespoons lukewarm water. Mix, and put the gelatin aside for swelling. Squeeze raspberries through a sieve or tea strainer to remove all seeds. Pour the puree into a saucepan and bring to a boil. Let the mix boil until it is reduced to half amount. (If you skip this step the marshmallow will not get a great raspberry flavor.) While the mix boils, cut the fresh or frozen raspberries in halves. Measure out 1/4 cups reduced raspberry puree, and mix the puree, lemon juice, sugar and light syrup in a saucepan. Bring the mixture to a boil and place a thermometer in it while you let it continue to boil. When the mixture reaches 110 degrees Celsius (230 degrees Farenheit), take it off the heat. (If you do not have a thermometer, boil for approx. 10 minutes.) Add the gelatin to the mix and stir well. Pour the mixture into a bowl and mix with a mixer until the batter becomes light pink and fluffy, almost like meringue. If you whisk for too long the marshmallow will start to stiffen and get really sticky, so watch out.